Just after an hour from my previous post, my RAM finally arrived. 4GB of RAM wasn’t really cut out for an extreme computer user like me. I really had to upgrade. 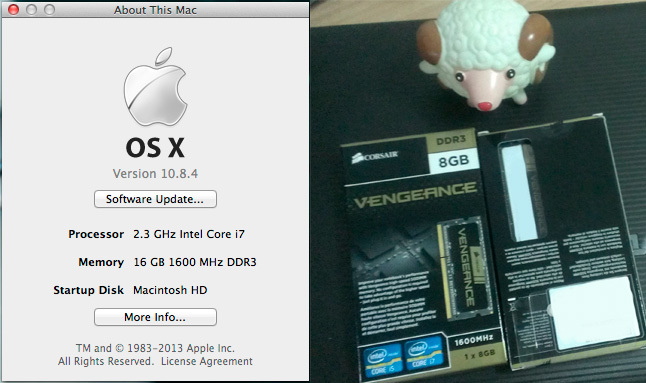 My MacMini now has 16GB of ultimate RAM goodness! I can just imagine the ease of working on my huge PSD files when doing client work as well as my CG drawings and paintings. For technicalities, I bought two Corsair Vengeance 8GB DDR3 1600 SODIMM (CMSX8GX3M1A1600C10) for a total of 16GB, the maximum RAM capacity of the MacMini 2012 model. After changing my RAM, I finally saw the model of Apple’s default RAM, it is Hynix HMT325S6CFR8C-PB. During the process of buying my RAM, I was actually worried since sites like OWC were selling 1.35V for the Macs. Of course it made me worry that a 1.5V RAM like Corsair may have some effects in the long run. It turns out the Hynix’s voltage is also 1.5V. Now that gives me the ease of mind that my RAM is not undervoltaged. Also, meet my lovely squeezable Ram – Aries, who loves to be caught on camera.